Good news for everyone! A type of seaweed called dulse tastes a lot like bacon. It's savory, umami, and salty. Fry it in a little oil and it's crispy just like bacon. This naturally occurring red marine algae grows along the Atlantic and Pacific coastlines. They've been eaten by Scandinavians for centuries, and are now being examined by researchers at Oregon State University. Just like other types of seaweed, dulse is a healthy eat. But dulse specifically is being deemed a superfood for being packed with iron, calcium, magnesium, and protein—it's 16 percent protein! It's also healthier than kale, the top superfood until recently. The researchers at OSU are patenting a variety of the seaweed that grows quickly than it already does. They want to farm it in tanks and make an industry around it—as salad leaf, salad dressing, an ingredient in peanut brittle, rice crackers, bread, and beer. By farming dulse, they can control the quality and keep it away from chemicals, metals, radioactivity, and microbiological contaminants that could be absorbed if the dulse grew in a polluted area. So far, the farmed dulse, which only needs saltwater and sunshine to grow, doubles in weight every 10 days. 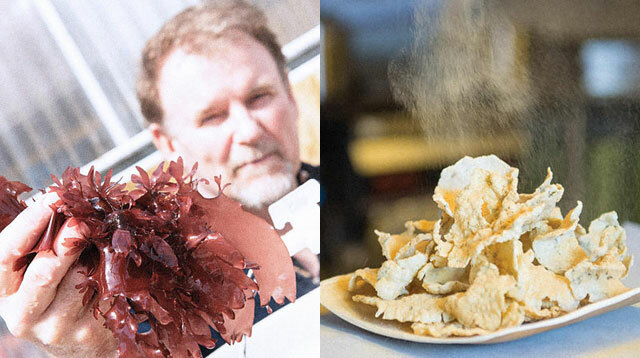 According to Chuck Toombs, a member of OSU's business school, dulse has "all the bells and whistles. It's a sustainable product. It eats carbon and produces protein. It's like God's vegetable."